Toronto music fans have been rolling in it the last couple of weeks. The smorgasbord of NXNE has lead directly into Luminato, which although not nearly as extensive at NXNE, musically, can certainly lay some claim to being as seismic a musical experience. Wednesday night saw this reporter in the audience at Massey Hall, where the audience delivered ovation after ovation as some of the best voices in the business paid tribute to Joni Mitchell on her seventieth birthday. And then the doyenne of folk took to the stage herself at the end of the second act and read a poem to the audience that took its inspiration from rain and Emily Carr. This was followed, to the awed shock of the gathered masses, by three numbers. Most in attendance understood that Joni would not sing—in fact, has not sung in public for more than a decade—but then the band started into Furry Sings The Blues. At first, the celebrant spoke more than sang, but she eased herself into it like she was getting into a hot bath and then there it was: the Voice. Just about as it had always been. The Festival audience drowned her out with applause after each number, and by the time the evening ended with a full-cast rendering of Woodstock, there were a considerable number of raw hands and wet eyes in the house. 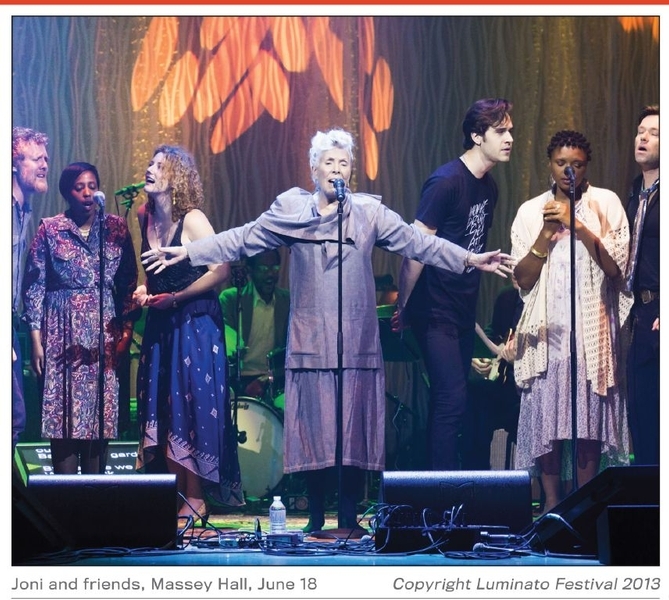 Meanwhile, although this edition of Luminato will be remarked on for this tribute, its new music offerings have also brought audiences out in droves. The Festival began with an astonishing, uncategorizable concert by Kid Koala at the Hub—where free, live acts like Carolina Chocolate Drops, Serena Ryder, and Maxi Priest have been filling the square all week—and reached their apogee on Wednesday night with the first of three performances by Hydra. The buzz had been building for days that this new supergroup—a mash-up of Snowblink, AroarA and Lesley Feist—would be playing the Courtyard Revue, and when they took the stage on Wednesday night, a mesmerised gathering was treated a seminal moment. Daniel Gesundheir, Ariel Engle, and Feist stood across the front of the stage and delivered a tight set made up of each other's songs, arranged for three voices, and designed to drop your jaw. Although some comments were made from stage about whether the three rows of people who were sitting in arcs across the open lobby of the Berkeley Street Theatre might want to stand, it was quite clear that those patrons on the floor couldn't have stood if they wanted to. They were stupid with joy, bathing in the luscious sound that went over them in waves. Of course, they were the ones in the house best capable of delivering the standing ovation Hydra earned from their astonishing set. Many present—for what was only the second time Hydra has played together as a band—remarked afterwards in the open courtyard that the set had had the feeling of history being made. This article has been viewed 2,394 times since being added on July 1, 2013. Comments on Hotter than NXNE?